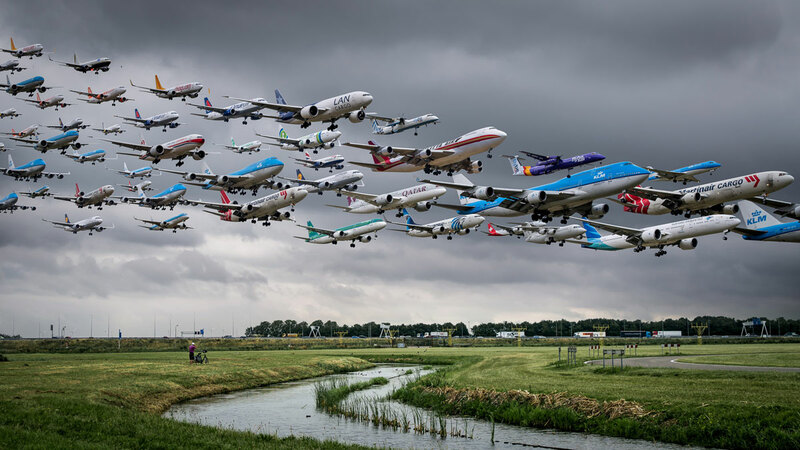 In an ongoing series entitled Airportraits, photographer Mike Kelly visits airports around the world, waiting for the right weather conditions before spending a day capturing airplanes taking off and landing. 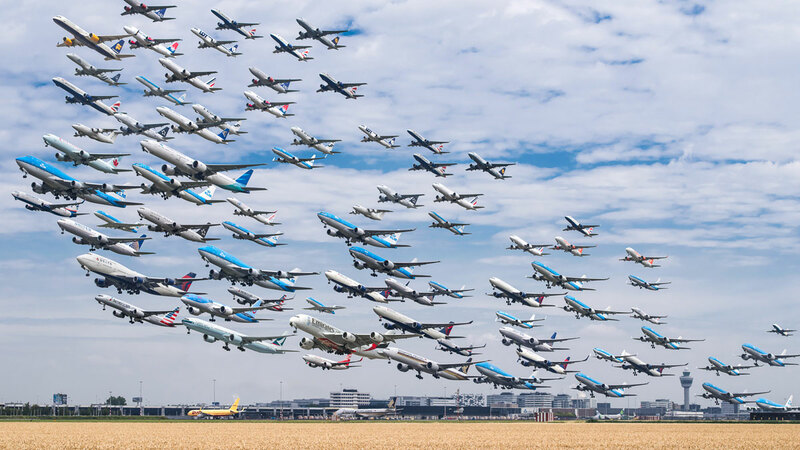 He then stacks the numerous photos into a single composite image that shows the breadth of airplanes and airlines that move people all around the world each and every day. We caught up with Mike to learn more about the project, the challenges he faced and the unforgettable moments along the way. To purchase prints or see more of Mike’s incredible photography, check out the links below. When did you start this project? What inspired you to do it? I’m actually an architectural photographer by trade, and in that line of work I’m doing a lot of compositing: blending lighting, time of day, and people, as I photograph buildings. Believe it or not, architectural photography requires a lot of photoshop in many instances, so I’ve been working with photo composites for years now in order to give my photos an interesting look and feel. So that brings us to the original image from LAX, conceived in 2014. 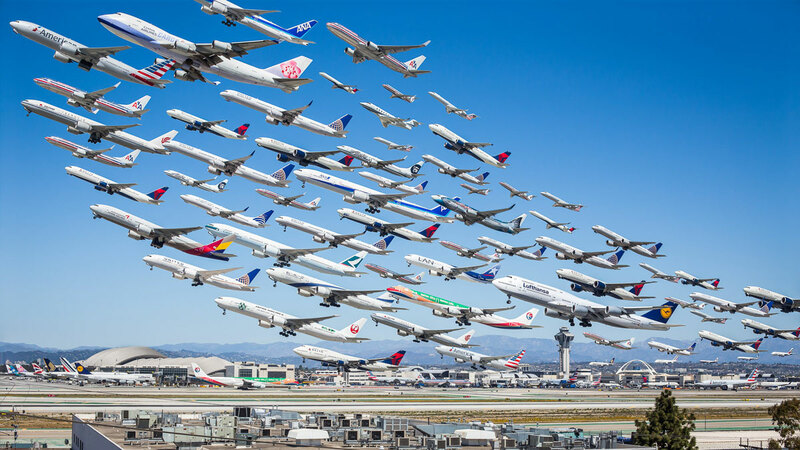 I’ve always been fascinated by aviation and one day while out at LAX plane spotting, decided that I wanted to try capturing multiple takeoffs and putting them together into a single image to show their flight paths and the sheer volume of traffic departing LAX. The crazy thing is that the first image was originally supposed to just be a proof-of-concept to see if the idea had any legs. I put it on the internet as kind of a “hey, check this little thing out that I did, it’s kind of cool” and it just went crazy viral. The inspiration behind the entire set of images was somewhat simple given the success of the original. I didn’t want to be a one-hit wonder, and I knew the idea had potential, so it was sort of something that had to be done. 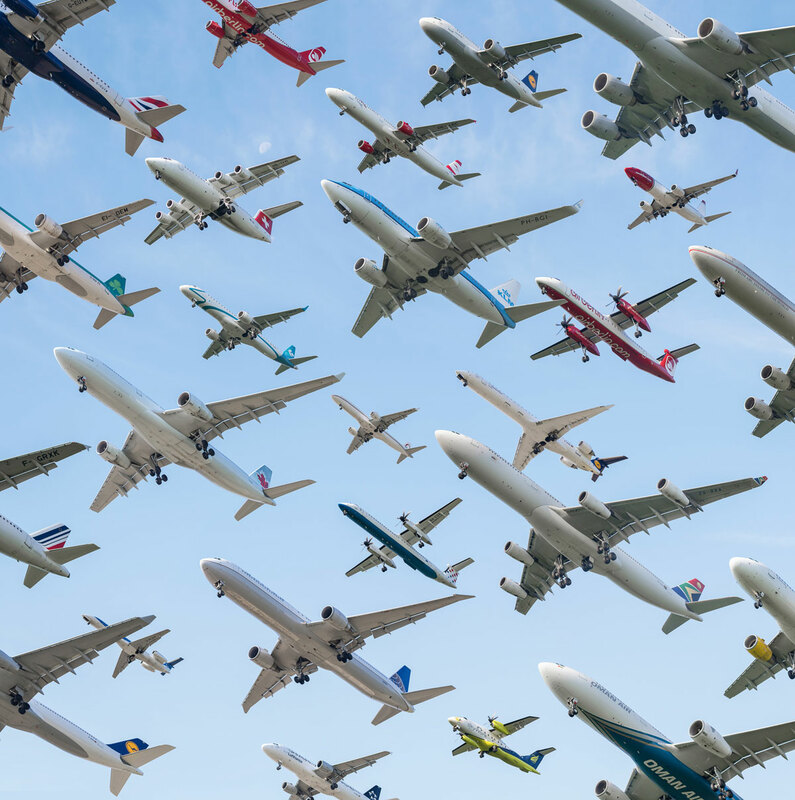 There are a ton of amazing airports, airlines, and airplanes out there that I wanted to photograph, so the plan was set in motion to try and capture as many as possible. Since I’m obsessed with airplanes, travel, and seeing new places, it was also a great excuse to get me out of my comfort zone a little bit. At the time I started the project, I had been photographing architecture for about five years straight and a break was in order, so it was also a nice change of pace! I mostly chose airports based on their setting or how iconic they are on a global scale. 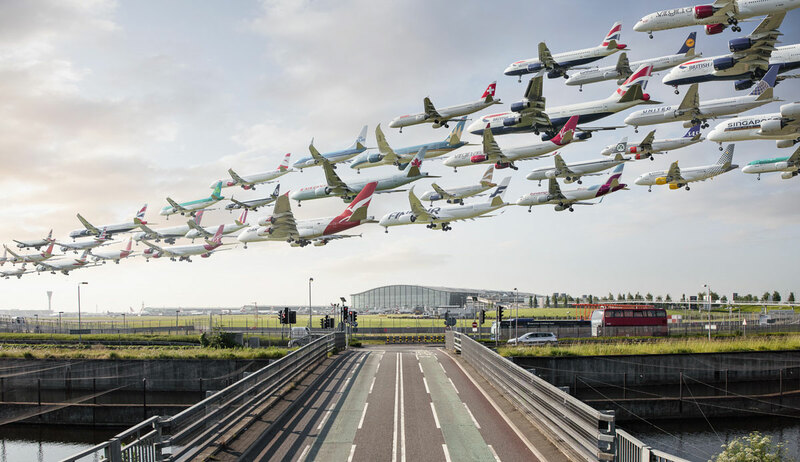 Heathrow is obviously one of the most well-known, for better or worse, airports in the world, set in the middle of what is probably the most famous city on earth. 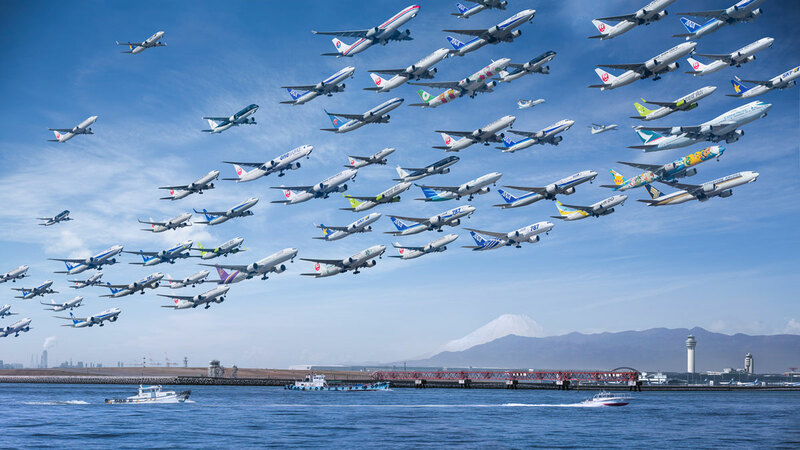 Haneda is the busiest airport in the world, and you can see the iconic Mt Fuji on a perfect day – I wanted to tie these amazing locations together with their air traffic in a way that hadn’t been seen before. Oh man – definitely the post processing. The creation of the images takes some concentration, but I wouldn’t consider it a challenge – certainly frustrating at points, especially when you take a trip somewhere for a photo that doesn’t materialize, but always an adventure. But the post processing – I really had to get in the zone. Some of these images took months to put together. Mind you, I wasn’t working straight through, but it was a couple hours a day, followed by a break to let my eyes re-adjust, followed by more tweaking. And I’d always miss something – like a rushed mask or imperfect clone which I had to go back and fix, and some of the documents are over 10gb in size. So it was a very slow, very frustrating process at times. There was more than one occasion where I almost didn’t get the shot due to weather or wind not cooperating. As I mentioned above, seeing Mt Fuji appear – when it was so integral to the shot and so rare to see – was incredible. It took two trips to Japan, the second of which was booked the day before I left, so it was a huge gamble to have everything come together. In addition, I had to take three trips to London to get the shots I wanted because the weather there is so incredibly fickle. 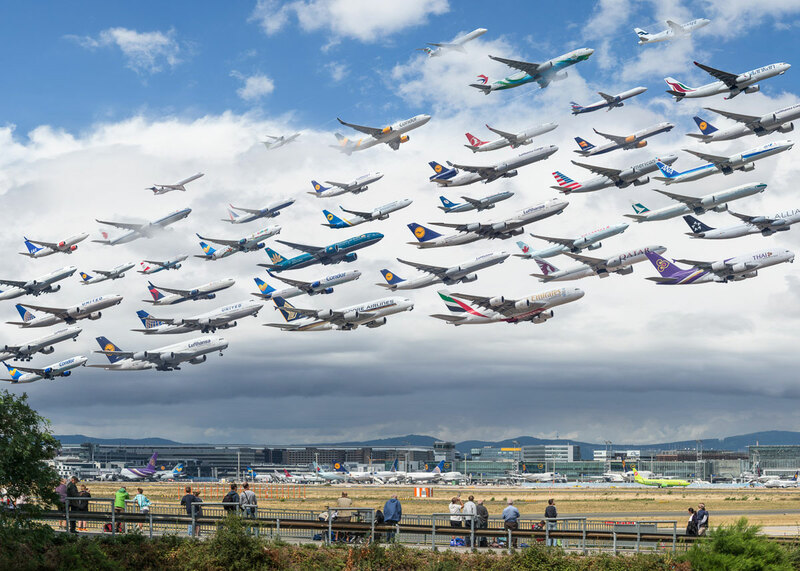 When it all comes together it’s just amazing – and you wake up and the wind is blowing the right direction, the clouds are great, and all of these interesting aircraft from far-flung corners of the globe are taking off in front of you. There’s a lot of moving pieces and getting them to fall into place was just great. How long is the process of making one of the composites? It really varied between shots. 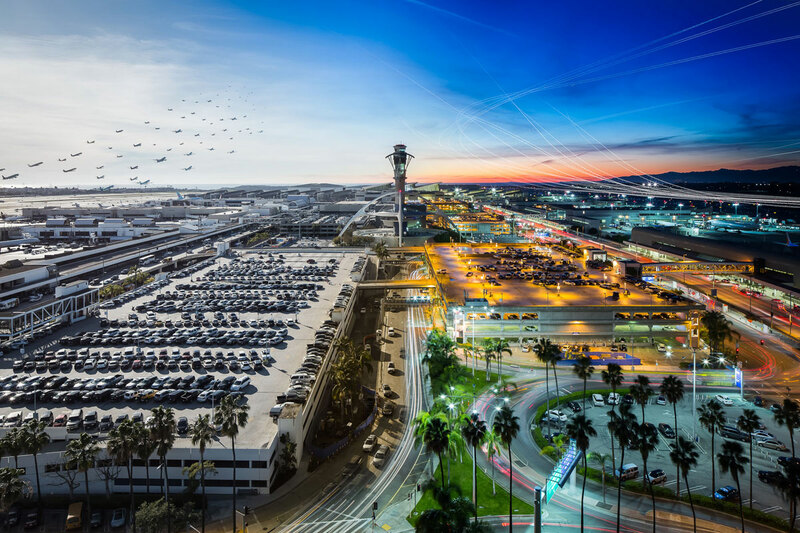 The first one at LAX made everything super easy for me – with an observation point that had a perfect view of the airport and the sun in the perfect spot throughout an entire day. Not the case at every airport! So the first thing I had to do, was in some cases, literally spend days driving and walking around perimeter roads to find the best spot, which is often uncharted territory. Even though plane spotting is pretty popular, I had to look a bit past the well-known or designated spots to find a location that would work well. 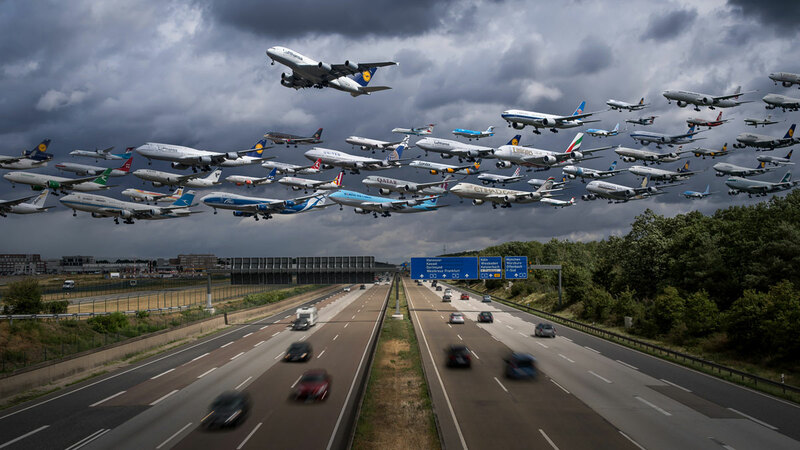 It was really important that I not only capture the planes but the spirit of each location – so for example, in Amsterdam I wanted to capture the lowlands and canals, and in Germany I tried to capture iconic things like the autobahn. Sydney, the beaches, etc. In addition to wanting to incorporate some local flavor, I had to make sure that the spot I chose had the sun behind my back for the entire day so that the lighting would be even over the course of the chosen time period, so this greatly limited my options. 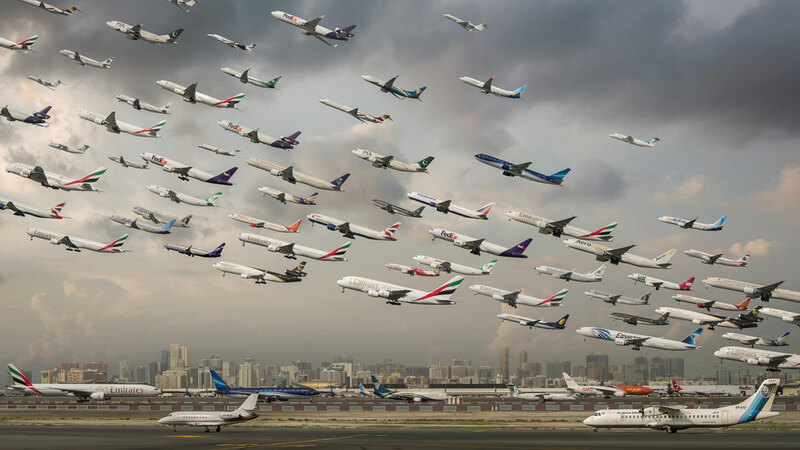 In a few cases I opted to shoot early in the morning to capture ‘rush hour’ at some of the more busy airports, e.g. 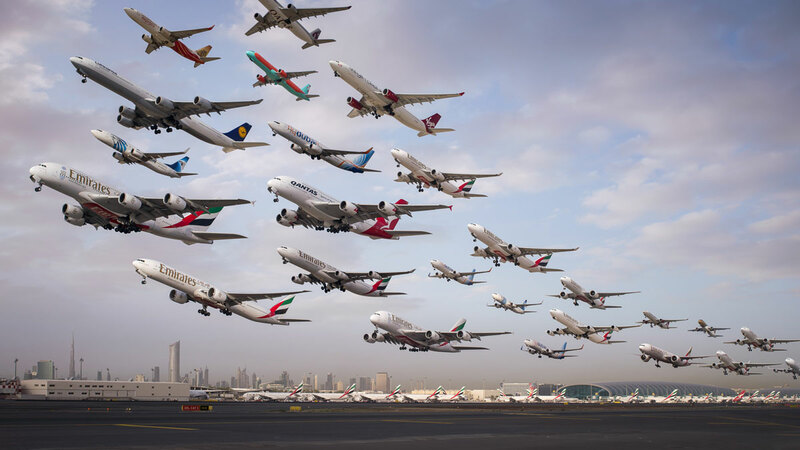 Dubai and Heathrow. While it makes for a dramatic photo the sun angle and colors are changing very quickly at that time of day, so these photos only captured a few hours at most before the sun made it impossible to continue shooting. So the first step of finding a spot was really tough! After I found a spot, I had to wait for a day where the winds, weather, and light all cooperated. Since planes usually take off into the wind, this meant waiting for a day that had steady winds in the direction that worked best with my chosen spot. If the winds switched halfway through the day, the entire day would be a wash. Similarly, if the weather changed dramatically throughout the day, it also made it exponentially harder to composite the images together as the color, lighting, and exposure on all parts of the scene changed with cloud cover and sun. 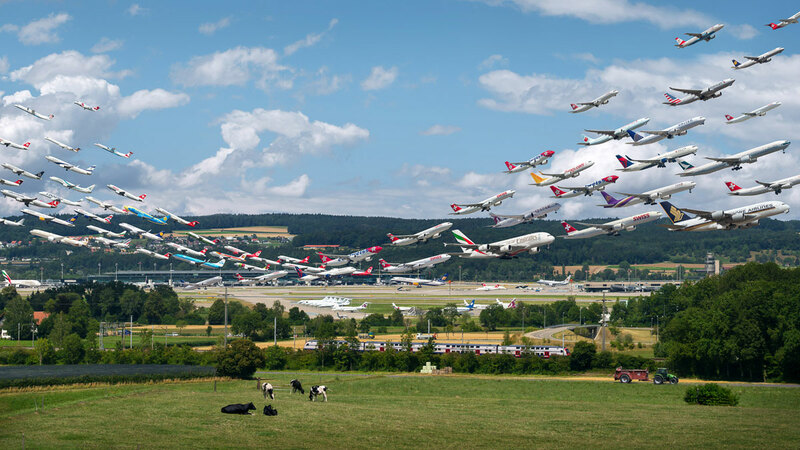 The Frankfurt images for example were both ridiculous in the amount of time I spent compositing them, perfectly matching exposure, sunlight, cloud cover, and so on, to keep things looking realistic. So the ideal situation was a great spot showing the planes, some local flavor, the sun behind me (or consistent cloud cover) and solid, steady wind for an entire day. Easy in a place like LA where it’s always sunny. In a place like London? You gotta be kidding me, right? It actually took three trips to London to get images I was happy with because the constantly shifting weather and winds. Same with Tokyo. Turns out they’re not lying when they say Mt Fuji is a fickle, fickle beast. It’s only visible on the clearest of days, so I had to take 2 trips to Japan to get the image I wanted. Once I had my spot and the weather and everything else in place, it was time to shoot the pictures. 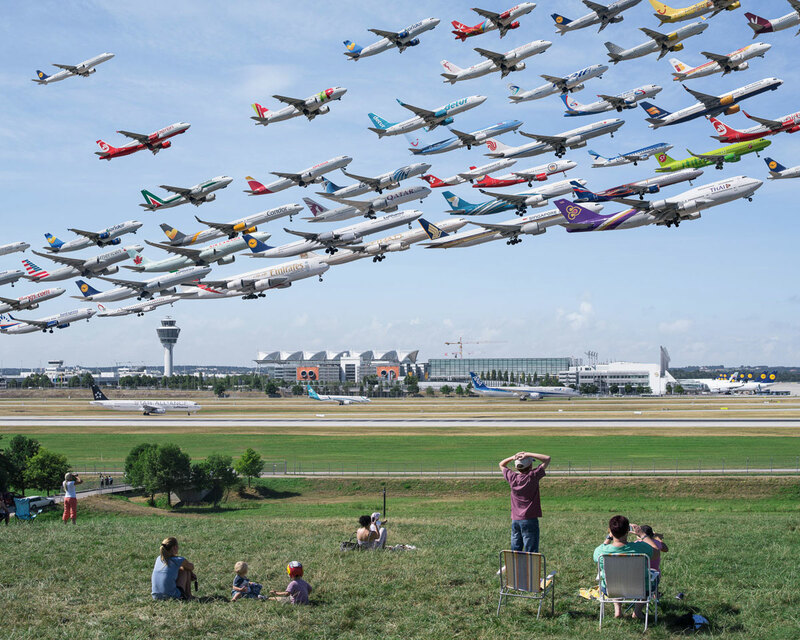 This was just as simple as putting the camera on a tripod and capturing every plane as it crossed through the viewfinder. Post production was also pretty lengthy for each shot. I’d select a background plate, and then stack all of the images with aircraft masked out on top of the base layer. I’d then remove or add the planes one at a time. For each plane that you see in the final images, I actually had 10-15 shots of each as it passed from left-to-right through the frame (or right to left, etc), and I selected the best image of each plane depending on how it fit best in the frame. It was important to me that I keep everything realistic whenever possible, so I wanted to have as many options as possible to make sure I could give each image movement and color. Kind of hard to explain in text, but it was very tedious! After I had all my planes in place, it was a matter of matching the brightness, color, and doing global adjustments like color grading and contrast. Some of the Photoshop files have hundreds of layers to make this possible. I think a few of the files were anywhere from 12-16gb in size. I would say Tokyo was my favorite new place – it’s just such an experience! The food, the transit, the lights and bustle of the city. Just amazing to take it all in or watch it go by. In order to get the shot of Haneda, I had to charter a fishing boat, which picked me up at around 4am. We drove out over the glassy waters of Tokyo Bay and not only did I see the quintessential rising sun coming up right in front of us, but seeing Mt Fuji emerge in the distance on that clear and calm morning was one of the most beautiful things I’ve ever seen. Just an entirely surreal experience to be out there in a 14 foot boat bobbing around all day. There’s also a special place in my heart for New Zealand – I have always said that I’ll retire there. The landscape is really just majestic and I know it’s cliché to say this, but I’ve never met a kinder bunch of people. What airport would you like to shoot next? I’d love to do some more in Asia – Hong Kong, Shanghai, Beijing, that sort of thing. Maybe even Russia, as they have some amazingly interesting planes. 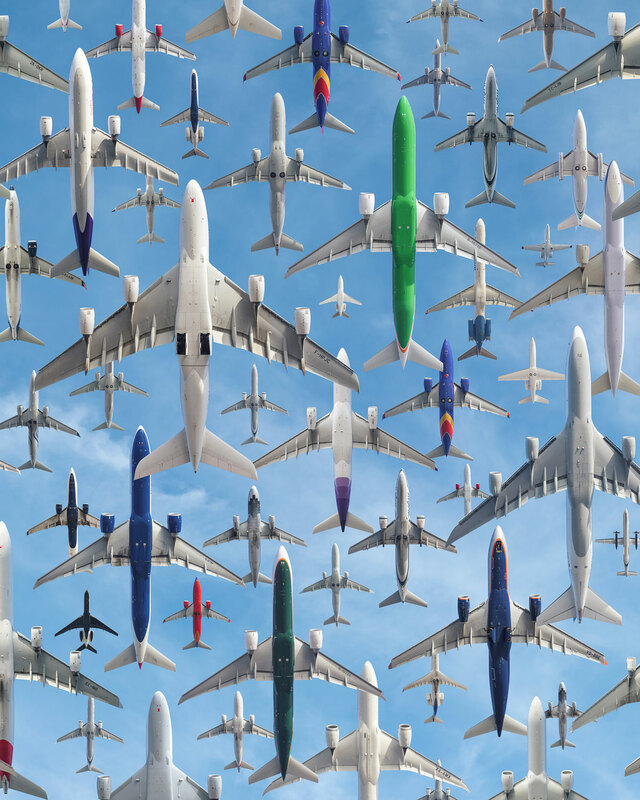 I’d love to work with some of these airports to make it happen, or get someone on the ground who can help me, as they’d be a huge undertaking in terms of visas and access. 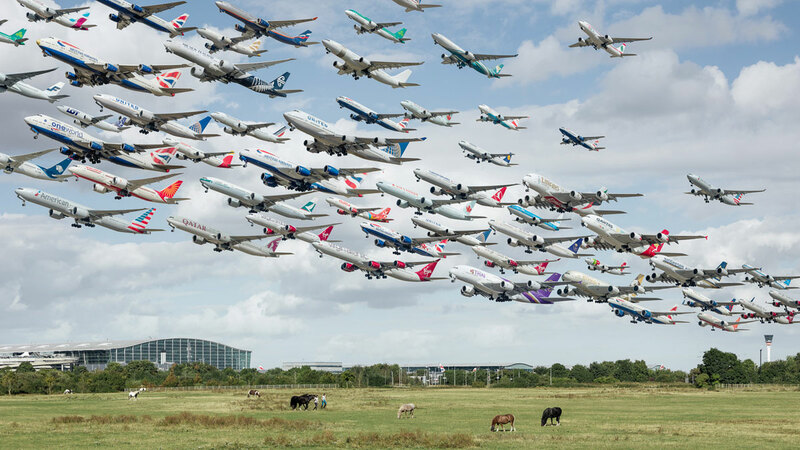 But the diversity of aircraft and scenery would be incredible.